Yesterday, Microsoft previewed its new Bing search engine and the early feedback from users was positive. 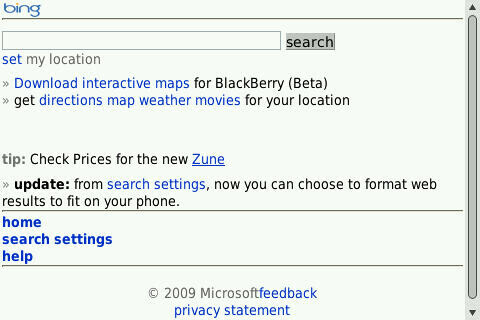 Today, the mobile version of Bing is up and running for use on the web browser of your mobile device. Search requests can be formatted to fit your specific cellphone. Results come back with links to sites that fit the parameters of your search and also include images if applicable, local news on your search and links to other related sites, all on one page. In other words, the results from a search are laid out by various headings which makes for a much cleaner look that is easier and faster to use than the crowded Google results page. You can access mobile Bing at m.bing.com on your phone's browser. Those devices with a direct link to Microsoft's now defunct Live Search (like the BlackBerry Storm, for example) can use that link to search on mobile Bing.